Summer and fun naturally go together -- kids are out of school, and the days are typically hot and sunny. That means it's important to take a few simple steps to ensure everyone stays safe and healthy while enjoying outdoor Summer fun! Here in Texas, the heat and Sun are brutal from June through at least September. Our teenage niece Lili visited us from Ohio for a few days this month. Part of her visit included a morning at our gym's resort-like outdoor pool area. 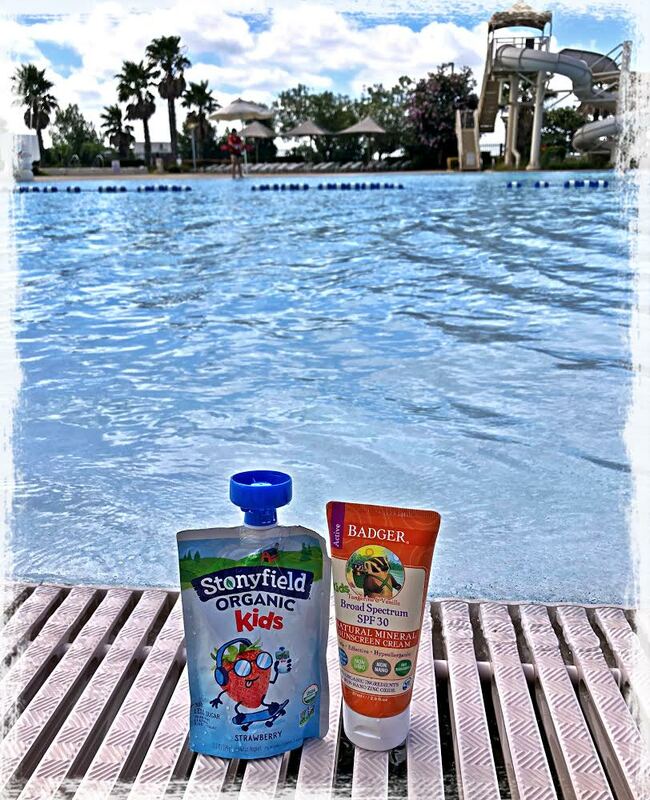 I made sure to pack a few key supplies to ensure our pool time was fun...and that we didn't end up hungry, sunburned, or dehydrated. 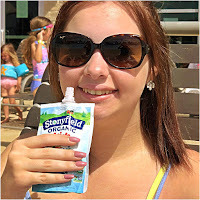 My tote bag included easy-to-transport Stonyfield Organic Kid Pouches yogurt and Badger Kids Sunscreen Cream SPF 30. Even us two "big kids" thoroughly enjoyed both products! Stonyfield's delicious Organic Kid and Whole Milk Yogurt Pouches are made without toxic persistent pesticides or GMO’s -- which means they're good for you and good for the planet too. 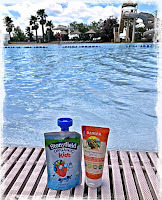 I brought squeeze packs of Strawberry Stonyfield Organic Kids Pouches to the pool with us. My personal trick for ensuring the yogurt pouches remained cold and safe to eat for our entire morning poolside was to freeze the pouches for 45 minutes before we left. By the time we were ready to enjoy our healthy snack mid-morning, the yogurt was perfectly cold for us to enjoy! I loved that we could enjoy a bit of our yogurt, then reseal our pouch if we wanted to while we took a dip in the pool -- then come back and finish it a few minutes later. Lili enjoyed our on-the-go yogurt. I felt great knowing that it had 25% to 35% less sugar than the leading kids’ yogurt, and that it's made with live active cultures. 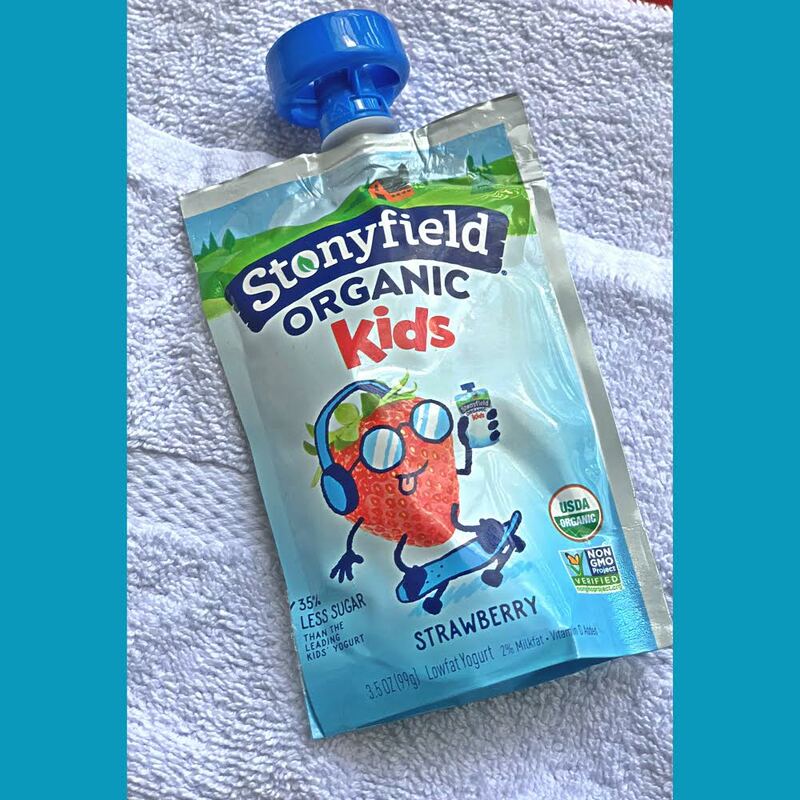 We tried the Strawberry flavor, but Stonyfield Organic Kid Pouches also come in other fun, kid-friendly flavors like Strawberry Banana, Blueberry, and Vanilla. Whole Milk Pouch flavors include Strawberry Beet Berry, Pear Spinach Mango, and new Choco-Mooo. 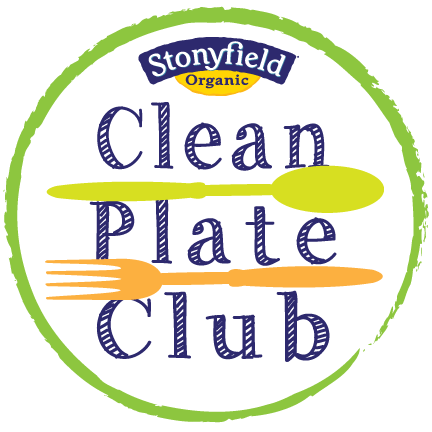 As always, all Stonyfield Organic products are USDA organic, pasture raised, Non-GMO Project verified, Kosher certified, and gluten free. 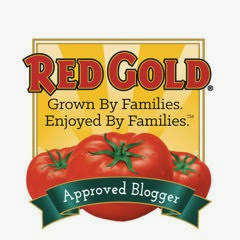 I love it when a product tastes great and is a healthier option too! I also received Badger SPF 30 Kids Sunscreen to try out this month. 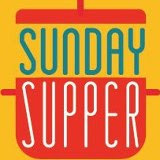 Badger is a small, family-owned, family-run, and family-friendly company located in the woods of Gilsum, New Hampshire. Like Stonyfield, they're also a B-Corp! If you're not familiar with B Corps, they are for-profit companies certified by the non-profit B Lab to meet rigorous standards of social and environmental performance, accountability, and transparency. 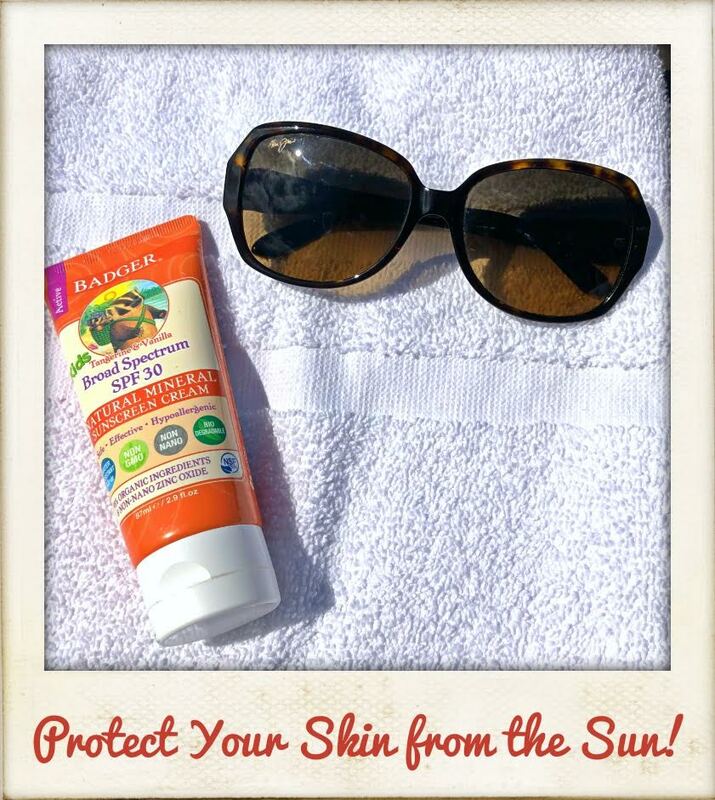 The sunscreen is scented with organic tangerine and vanilla, so it smells exactly like a creamsicle! Kids of all ages absolutely love how it smells, making it really fun to use. Water resistant for 40 minutes, Badger's SPF 30 Kids Sunscreen contains six simple ingredients -- including non-nano zinc oxide, a safe and effective active mineral ingredient. 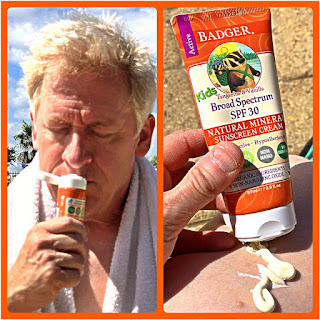 It also contains organic skin-soothing sunflower oil, beeswax, and vitamin E. The Badger sunscreen absorbed into our skin quickly and smoothly -- and I received a ton of compliments poolside on how great it smelled! To round out my Summer poolside tote bag essentials, I included sunglasses to protect our eyes from the Sun's harmful rays -- the sunshine really reflects on the surface of a pool! I also packed each of us a frozen bottle of water that provided us important cooling hydration all morning long as it thawed. Finally, I made sure to include some crackers and fruit to go along with our yogurt. That kept the morning munchies away until it was time to leave the pool and grab some lunch. Summertime fun is always enjoyable...but it's also important to take a few simple precautions to ensure that everyone stays nourished, protected from the Sun, and well hydrated. 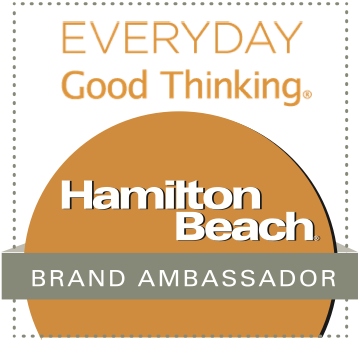 With Stonyfield and Badger, achieving these goals is a snap! Disclosure: This post was created in partnership with Stonyfield Organic and Badger. I received complimentary yogurt coupons, sunscreen, and other compensation to facilitate this post. As always, all opinions shared are solely mine.